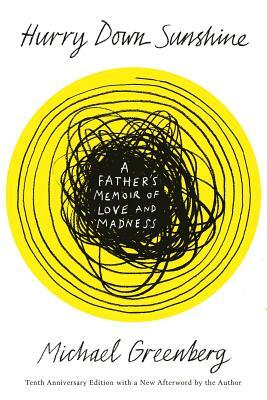 This international bestseller is an extraordinary family story and an exceptionally powerful memoir about coping withbipolar disorder, now with a new afterword for the ten-year anniversary edition. Michael Greenberg recounts in vivid detail the remarkable summer when, at the age of fifteen, his daughter was struck mad. It begins with Sally's sudden visionary crack-up on the streets of Greenwich Village, and continues, among other places, in the out-of-time world of a Manhattan psychiatric ward during the city's sweltering summer. It is a tale of a family broken open, then painstakingly, movingly stitched together again. Girl, Interrupted and An Unquiet Mind. A native New Yorker, Michael Greenberg is the author of the memoir Hurry Down Sunshine, published in sixteen countries and chosen as one of the best books of 2008 by Time, the San Francisco Chronicle, Amazon.com, and Library Journal; and Beg, Borrow, Steal: A Writer's Life. His writing has appeared in such varied places as O, The Oprah Magazine and The New York Review of Books. He lives in New York.